The University of Alaska Anchorage welcomed its first occupant of the Global Entrepreneur in Residence program who’s racked up a string of accomplishments, including inventing a mouse cleaner and founding an international technology start-up. 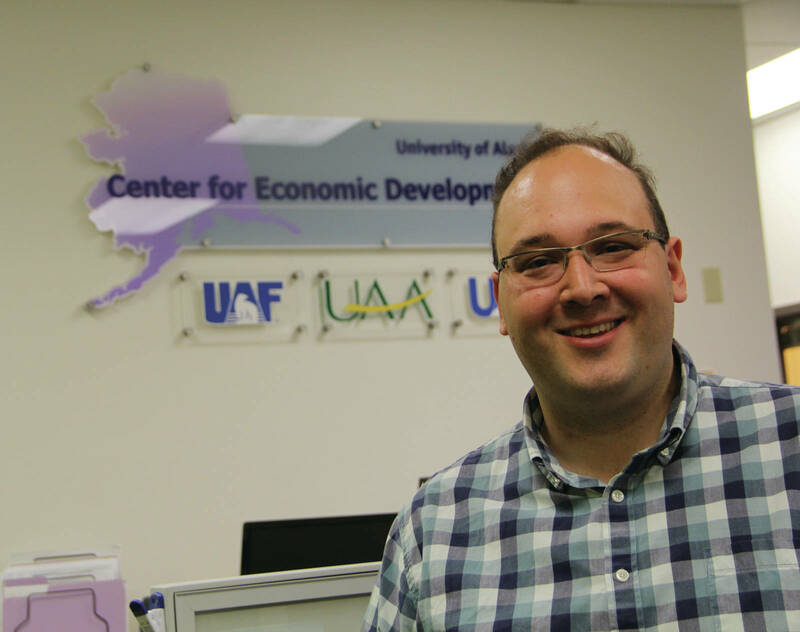 Nigel Sharp’s position at UAA will involve mentoring entrepreneurs and connecting them to expanded networks. Community members, students and faculty will be able to consult with Sharp. His first day in the 18-month position was June 19. UAA will be in distinguished company with GEIR programs already established at Colorado, Massachusetts and New York universities. The position is funded by private contributions, not public money. For UAA it’s a newly carved position. But it’s not a new one for Sharp. He comes from the University of Boulder Colorado where he was seated in the same position for a two-year residency. There he focused on helping people commercialize their ideas, assisted with “thought leadership” and research that has an entrepreneurial component as well as networking people into the global startup community. “There are a lot of the same components to the position here, the difference being location and attitudes. Here in Alaska we have an emerging ecosystem that isn’t well developed, while in Boulder, it was more of a comparative perspective to” what the business community had already developed, he said. The company operates in Armenia, Bulgaria and the USA. Sharp led the fundraising efforts and took the company through three rounds of funding through the Eleven Accelerator in Bulgaria. He found both venture capital and Angel Investors from the USA. Something of a child prodigy, Sharp invented and marketed a computer mouse cleaner while a young teen. He had won as a national finalist in the Irish Young Entrepreneur competition with his mouse cleaner. Profits from the cleaner helped fund his education. At the age of 16, Sharp had been building websites for customers, and found himself invited to review proposals submitted to the Irish Government Board of Education to help them select a professional company. “The thing about technology is that it’s the least ageist industry, I believe. It requires new and relevant knowledge,” he said, referring to the experience of advising his elders. Enthusiasm for each new project has provided the story thread of his life, he said. He attended King’s College London where he earned a degree in mechanical engineering and a master’s in both digital technology and engineering. From his studies he chose to volunteer and then live and work in Armenia after being promoted to IT Project and Technical Systems Manager at the $70 million Tumo Center for Creative Technologies. The staff grew from 10 to 189. One of the champions of establishing a UAA GEIR position, Allan Johnston, said Nigel’s perspective will be invaluable to start-ups. “Nigel sees the world differently – he’s the ‘outside looking in’ that we need here,” he said. Sharp moved to Anchorage with his wife and daughter. He says he’s looking forward to meeting the Alaska entrepreneurial community and helping to connect them to the global entrepreneurial community.